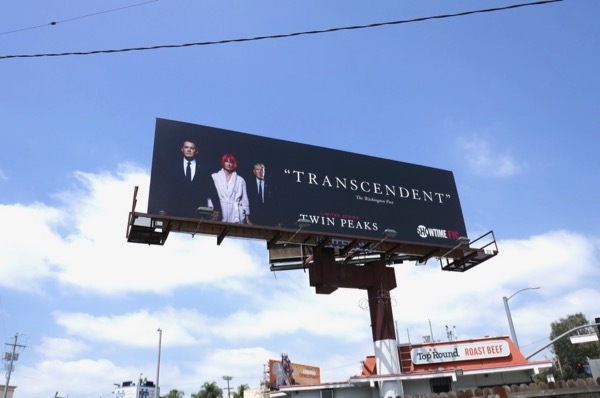 As there are so many Emmy consideration billboards filling L.A.'s city skyline of late, Daily Billboard has decided to collect together several channels offering for expediency's sake. Today it's the turn of FX, Fox and Showtime, all known for their great drama and comedy series. 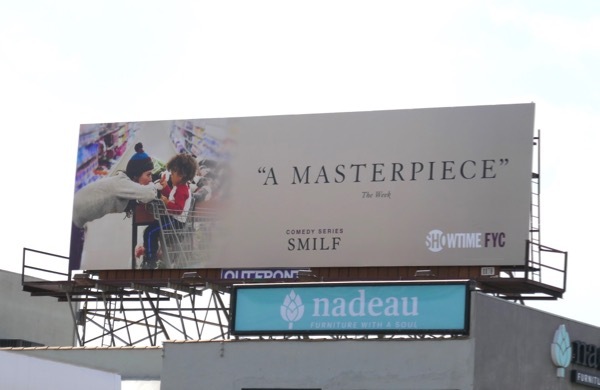 FX is always one of, if not the first Emmy campaigner out of the gate and this year it's hoping to repeat the success of the first season of American Crime Story which garnered 22 nominations and reaped nine Emmy wins for the dramatisation of The People v. O.J. Simpson. 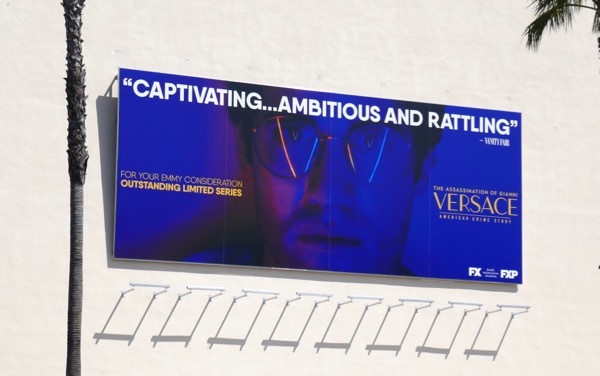 The second season of the crime anthology series was about The Assassination of Gianni Versace in 1997 and starred Darren Criss as 'Andrew Cunanan', the killer of the legendary fashion designer, whilst Penélope Cruz played his grieving sister 'Donatella Versace'. 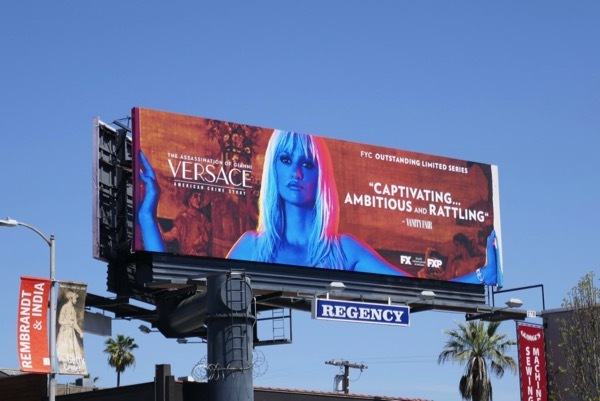 These striking Emmy consideration billboards for the nine-episode season were the snapped along Pico Boulevard from April 26 to May 17, 2018, plus be sure to check out the cool Medusa head billboards for the series launch from earlier this year. 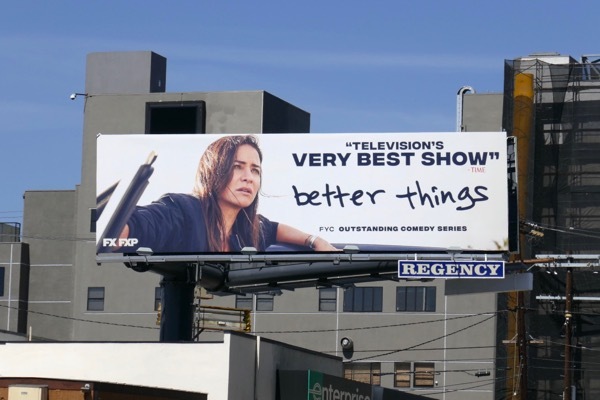 Meanwhile this Emmy consideration billboard for the sophomore season of Pamela Adlon's FX comedy, Better Things, was the first Emmy FYC ad creative Daily Billboard spied this year. These bulletins were spotted along Olympic Boulevard in multiple ad sites from April 3 to April 26, 2018. Let's hope Louis C.K. 's involvement with the show doesn't sour TV Academy voters in light of the comedian's admission of sexual misconduct. 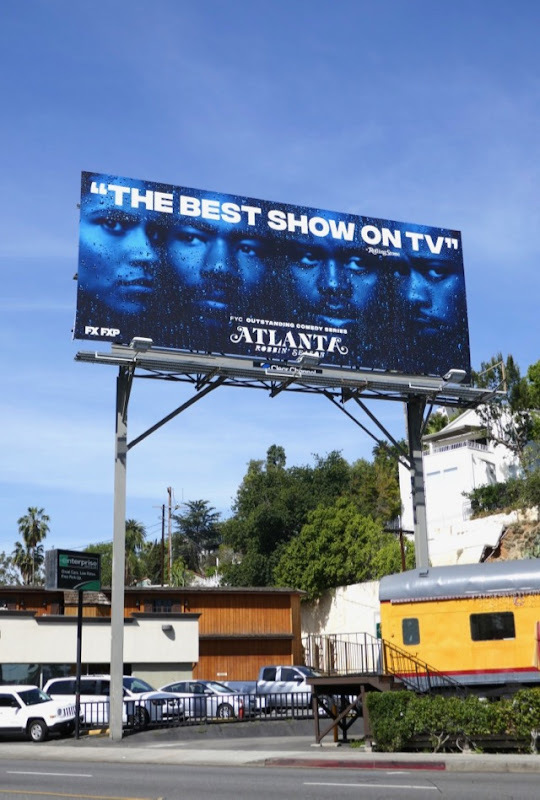 Another FX series can for a second season this year was Donald Glover's Atlanta, back for a groundbreaking Robbin' Season. 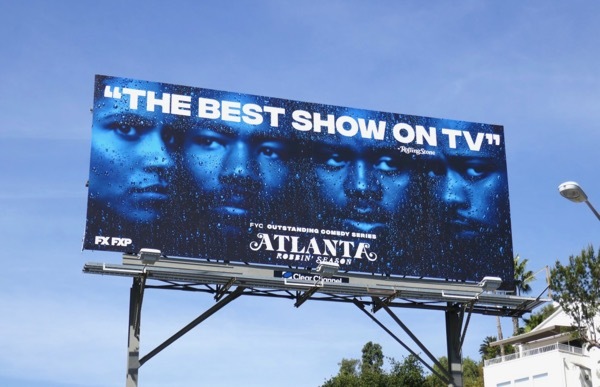 The comedy about two cousins and their friends trying to make it on the Atlanta rap scene nabbed six nominations and two Emmy wins for its debut season, so let's see if it can repeat or exceed that success this year. 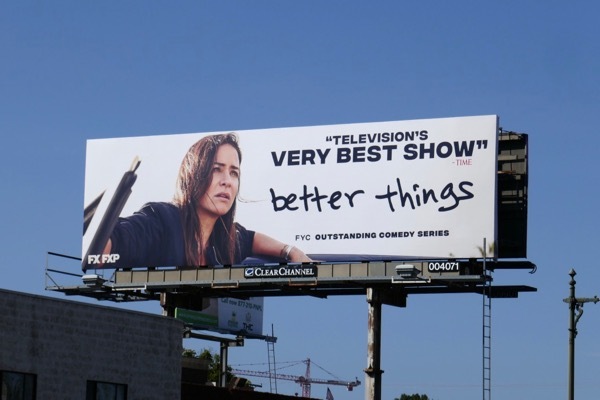 This 'The best show on TV' Emmy consideration billboard was photographed above West Hollywood's Sunset Strip on April 10, 2018. 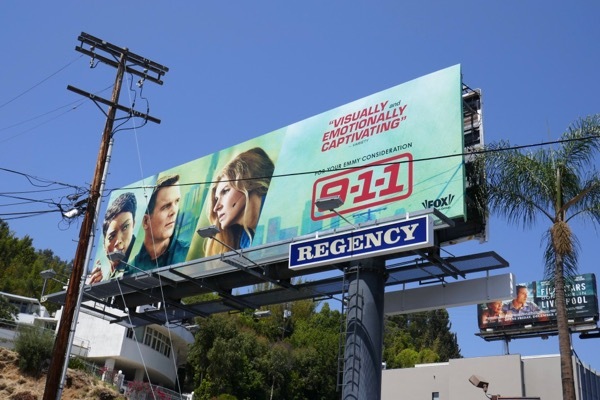 In addition to America Crime Story, Ryan Murphy and Brad Falchuck were also responsible for Fox's first responder hit series, 9-1-1, starring Angela Bassett, Peter Krause and Connie Britton. 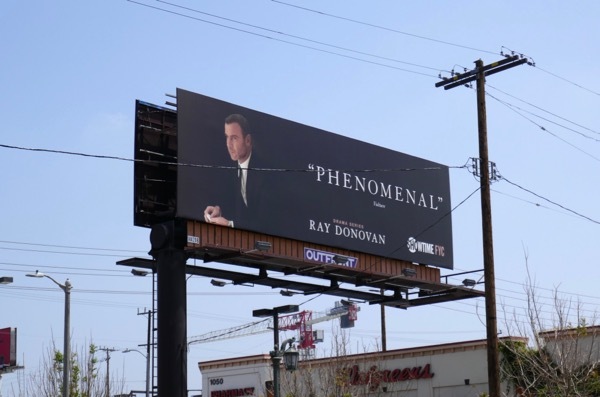 Let's see if this Emmy consideration billboard, snapped along the Sunset Strip on May 29, 2018, can help the high-pressure drama about the police, firefighters and paramedics nab some Emmy nominations for its rookie season. 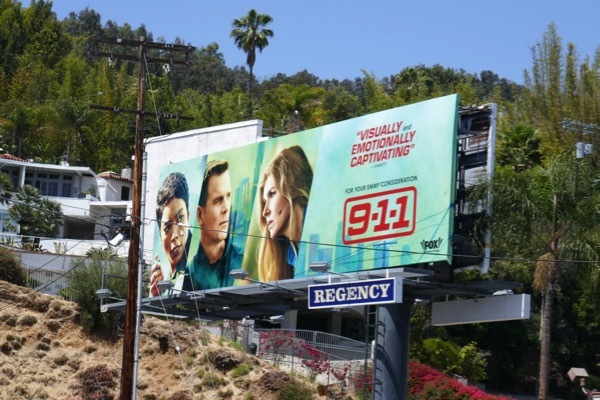 You really should also check out the rollercoaster cut-out billboard for 9-1-1 which really turned heads and captured the spirit of the show for the series debut at the start of the year. 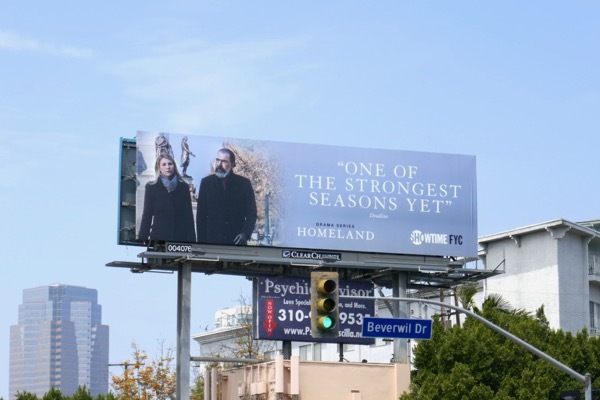 For the first time in many years, Showtime seems to have had a bigger Emmy presence in the city skyline for its programming (maybe to growing pressure from streaming upstarts like Netflix, Hulu and Amazon), and even though it has many disparate shows, this year its FYC campaign feels very cohesive. 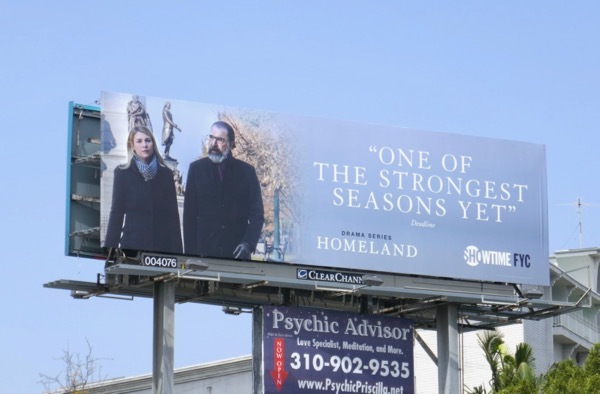 Terrorist and political drama Homeland has already amassed a whopping 36 Emmy nominations and taken home eight trophies to date, so let's see if this FYC billboard for its seventh season, snapped along Pico Boulevard on May 28, 2018, can help increase this total. 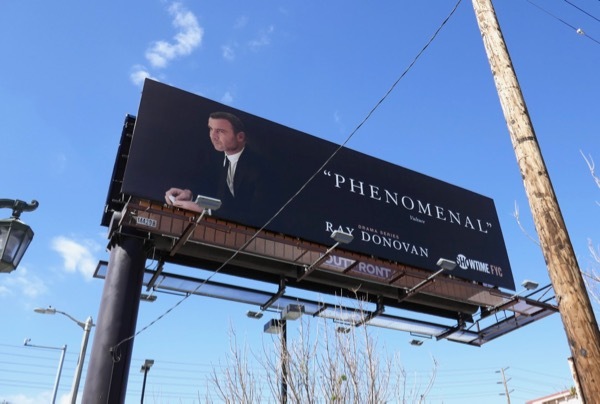 Liev Schreiber's Ray Donovan, returned for its fifth season on Showtime in this Emmy eligibility period, so can the fixer drama score more Emmy nominations to add the the existing nine nods and one win from previous seasons? Frankie Shaw's twenty-something parenting comedy, SMILF, made its debut on Showtime this year, but can it impress Emmy voters enough this season. 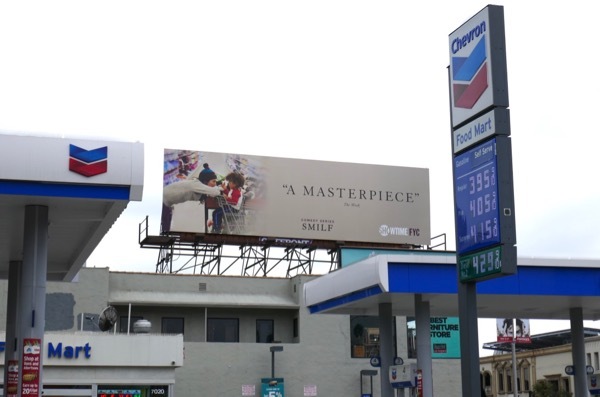 This freshman season Emmy consideration billboard was spotted above Beverly Boulevard at La Brea Avenue on May 23, 2018. One of Showtime's current longest-running series, Shameless, was back with more family dysfunction for its eighth season. After four consecutive Emmy nominations for Outstanding Actor, can William H. Macy finally win an award for the father of the Chicagoan clan, 'Frank Gallagher'. 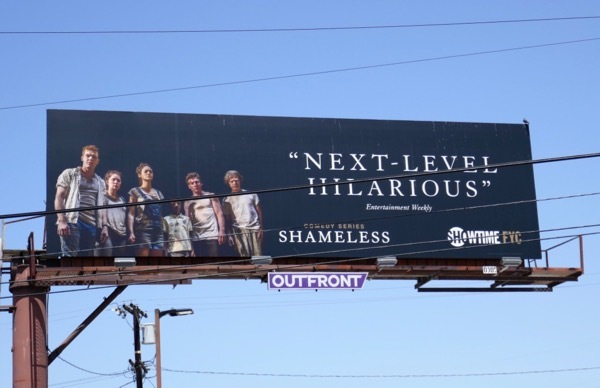 This Emmy consideration billboard featuring the hilarious 'Gallaghers' was captured along Venice Boulevard on June 2, 2018. 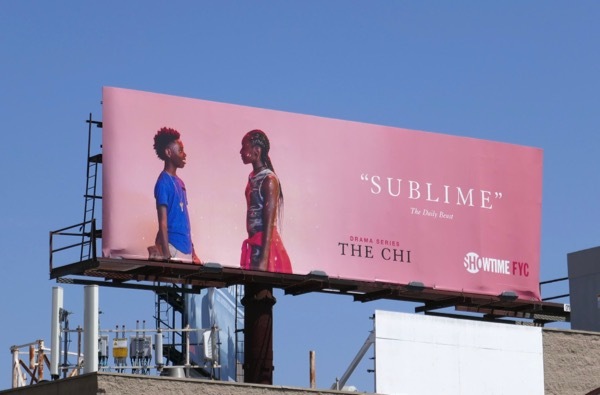 Emmy-winning writer Lena Waithe's star continues to rise on television with her original drama series, The Chi, which shows a different side of Chicago viewers may not have seen before. 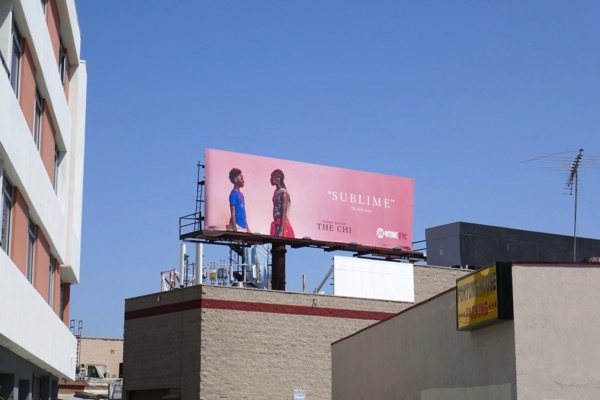 This 'Sublime' pink Emmy consideration billboard really stands out along Olympic Boulevard and was photographed on May 29, 2018. 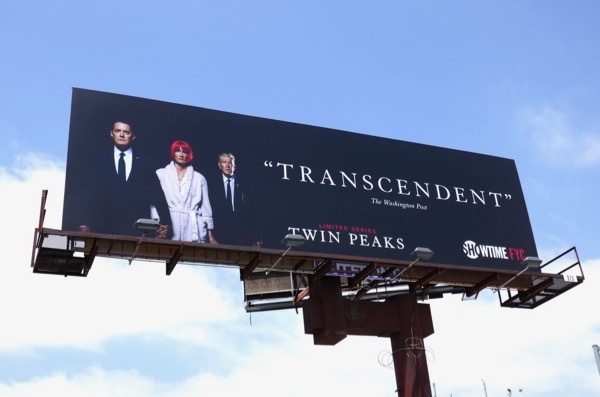 And finally for this collection (although we're sure we've missed a FYC billboard for Billions somewhere), here's a 'Transcendent' Emmy consideration billboard for the eighteen-part revival of Twin Peaks featuring Kyle MacLachlan's FBI Agent 'Dale Cooper', Laura Dern's 'Diane' and David Lynch's FBI Deputy Director 'Gordon Cole', captured along Olympic Boulevard on May 27, 2018. David Lynch's return to Twin Peaks twenty-five years after the first two groundbreaking seasons may not have been everyone's cup of tea when it came to audience size, but it certainly brought us a television experience that we've never seen before and really did leave enthusiasts wanting more of the eccentric, bizarre and haunting storytelling. 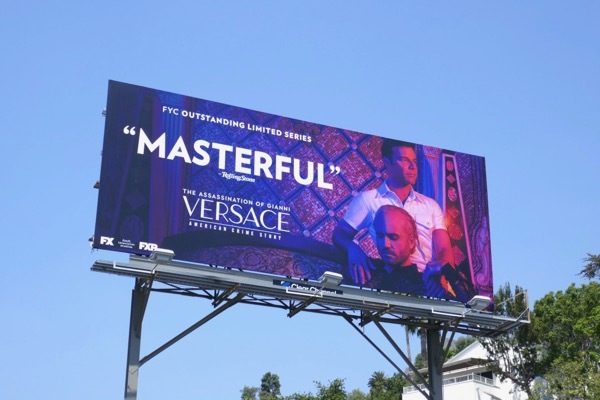 UPDATED: Here's another 'Masterful' Emmy consideration billboard for this season of American Crime Story, this one featuring Edgar Ramirez as Gianni Versace and Ricky Martin as his lover Antonio, snapped along the Sunset Strip on June 7, 2018. 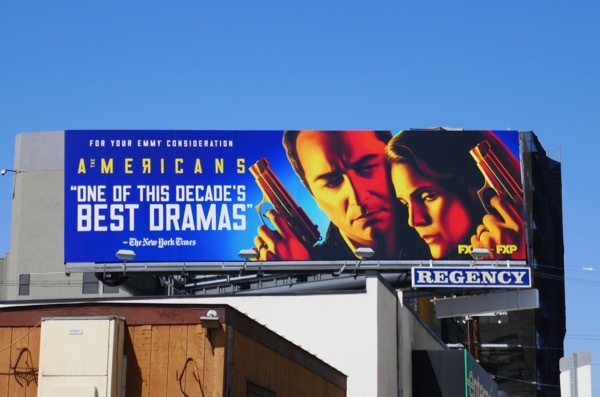 UPDATED: And finally here's an Emmy consideration billboard for the sixth and last season of FX's 80s Russian spy family drama, The Americans. 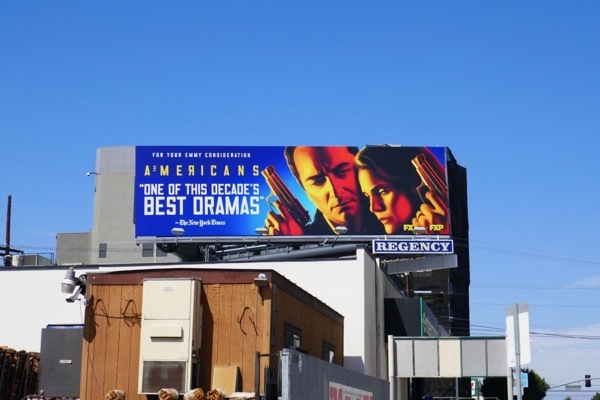 This series and its stars, Matthew Rhys, Keri Russell and Noah Emmerich certainly deserve some recognition for a fantastic and satisfying final season and this bold Emmy FYC billboard was spied along Olympic Boulevard on June 15, 2018.